Olek is decidedly with her. 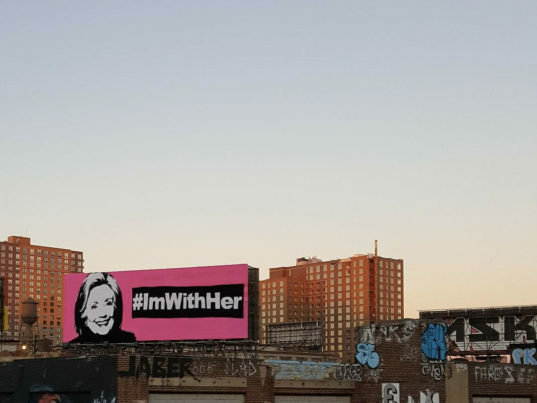 The Poland-born, New York City-based artist, whose real name is Agata Oleksiak, has crocheted a 16-by-46-foot blanket that features a black-and-white rendering of Hillary Clinton’s face and the hashtag #ImWithHer against a neon-pink backdrop. Nailed on a billboard overlooking New Jersey’s Route 139 highway, the art piece is Oleksiak’s “uncommissioned [sic] letter to Hillary Clinton, a letter from a woman, an artist, and a naturalized U.S. citizen,” she wrote on Instagram. The entire piece, which consists of 94,880 stitches, required the assistance of 38 helpers over four weeks to create, according to the New Yorker. The blanket-billboard was installed over the weekend. “This is my gift to Hillary,” Oleksiak added. Olek is decidedly with her. 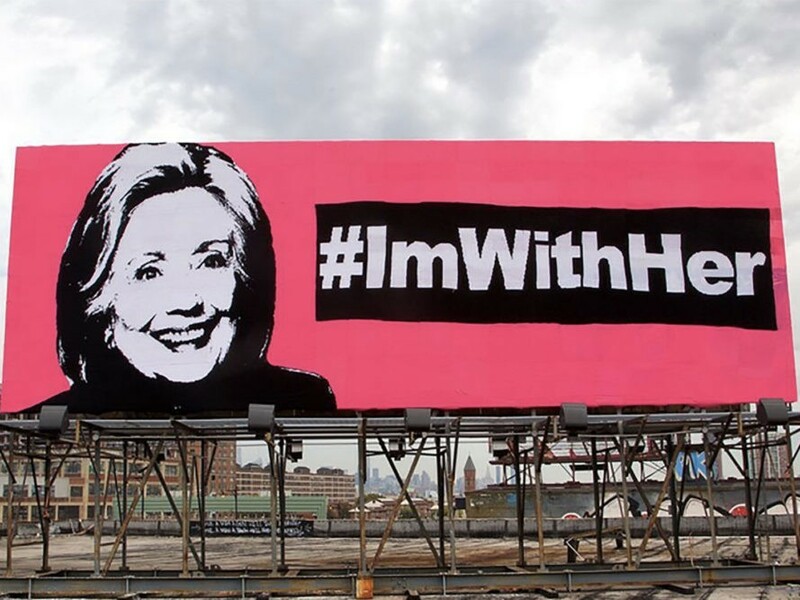 The Poland-born, New York City-based artist, whose real name is Agata Oleksiak, has crocheted a 16-by-46-foot blanket that features a black-and-white rendering of Hillary Clinton's face and the hashtag #ImWithHer against a neon-pink backdrop. Nailed on a billboard overlooking New Jersey's Route 139 highway, the art piece is Oleksiak's "uncommissioned [sic] letter to Hillary Clinton, a letter from a woman, an artist, and a naturalized U.S. citizen," she wrote on Instagram. The entire piece, which consists of 94,880 stitches, required the assistance of 38 helpers over four weeks to create, according to the New Yorker.